Armored Warfare offers free to play combat within powerful combat vehicles. Drawing plenty of inspiration from the “World of” franchise that dominates the market this experience has solid foundations but also has plenty of innovation up its sleeve. Choosing to focus on vehicles from all the way back to 1950 but also including modern day behemoths there are plenty of vehicles to take control of. With stunning graphics and destructible environments each tank not only looks great but also feels powerful as you crush environmental elements underneath your tracks. These vehicle options fall into five broad classes of vehicles which includes main battle tanks, armored fighting vehicles, light tanks, tanky destroyers and artillery. As one would expect each plays a different role on the battlefield and mixing between your favourite vehicles is easy as the battle needs change. Armored Warfare also has some built in customisation that lets you steer your preferred choices to certain enhancements and visual customisations. Unlocking these options will require a decent amount of gameplay which can be split between the PvE (co-op) and PvP game modes that offer all sorts of different missions, maps and objectives. From desserts to frozen landscapes and city locations Armored Warfare has a decent offering of maps which are likely to continue to grow with time. 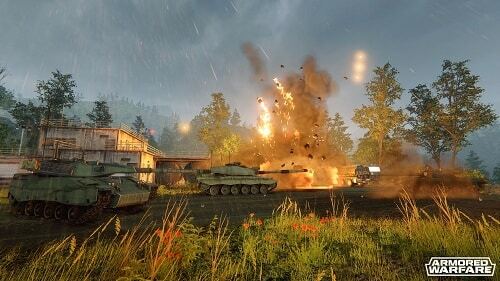 While the game definitely feels reminiscent of World of Tanks the differences that Armored Warfare offers make it well worth trying, especially if you’ve avoided the small but growing genre. Most notably is the step forward to the modern day which not only means more powerful and unique tanks but new technological equipment that alters combat with the likes of thermal sights and signal jammers. 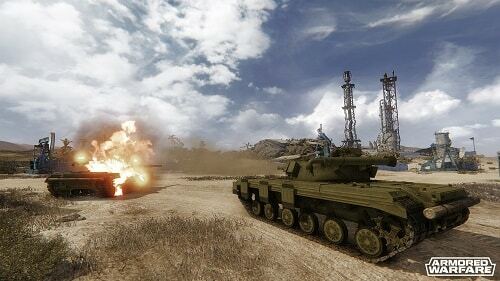 With the co-op opportunities also encouraging you and your friends to fight together against strong AI and the great looking graphics Armored Warfare is shaping up to be the hot new tank vehicle experience. Enjoy modern day tanks in this vehicle combat game. Fight with friends in PvE co-op modes. Upgrade and customise your vehicles with modern technology. Choose from 5 different and varied tank classes. Plenty of free to play content.